I was five and a half the summer Springy had her first litter of puppies. 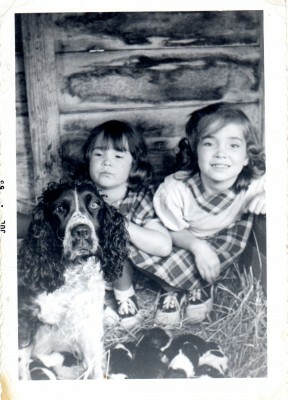 Springy was our first dog, a beautiful Springer Spaniel that my Dad had gotten about a year earlier. She would be the first of many Springers that Daddy would raise and train to hunt. I can remember when we first got her; my sister and I would carry her around in an old bushel basket. We just loved that dog but back to my silly story of the first time she gave birth. My sister and I had gone out to check on her. AGAIN. We wanted puppies! Dad had moved her into a special enclosure inside one of the old sheds out back. He had lined the floor with hay and it had a special door that could be opened to let Springy out into an area outdoors that he had fenced for her. He wanted to be sure that he knew where those puppies were born. I remember opening the big door to the shed and there in the middle of all the hay was Springy – and she was throwing up puppies! At least that is what my sister and I thought was going on. In reality Springy was licking off the amniotic sack but it sure looked like she was throwing up puppies to us! We ran back to the house to try to get Dad to come save the day. Daddy worked for Consumers Power Company and had been out all night restoring power after some lines went down in a storm. He would not wake up! We shook him and pleaded for him to get up – but he wouldn’t budge. I distinctly remember jumping on him and begging “Get Up!” He just rolled over and told us Springy would be fine without him. I guess we must have finally given up and just gone back to see the new puppies. That is one of the things about childhood memories and growing old – you don’t remember all the details, only the highlights! This memory was posted in Memories FOR Amara and tagged Kc the child, puppies on November 15, 2013 by Grandma Kc. Great story. These memories are such a wonderful gift for Amara. I am sure she will treasure them along with all the personal memories that you provide her. Thanks Olga. I think it is fun for her to see how different my childhood was from hers. Must admit I am having fun with it. My initiation into the mystery of birth came at my grandfather’s farm, witnessing a sow giving birth. An indelible experience! Loved your story and the picture. What a cute picture! Yours is a charming story that reminds me of when our cat, Tinkerbelle, gave birth to 5 kittens in a deep wooden box filled with sweet smelling dried grass in grandma’s backyard shed. Between grandma’s house and ours we kept all of the babies, but mother, very wisely, made sure that they and Tinkerbelle were spayed! Amara will love having this story in her personal treasury of family memories! What a wonderful memory. When my daughter was about five, we visited family and they had just had new puppies. Absolutely nothing more fun than puppies. What a great memory! In April I saw my first animal being born — the last of the kittens born in our backyard! I was looking at the newborns… and whoops! there was one more! What a great photo. I can completely imagine little girls thinking that the dog was throwing up puppies. I love the idea of blogging memories for Amara. Brilliant! What great memories to pass on to Amara. Great picture too. This is such a great post- I loved reading about your precious mama dog, Springy! “Throwing up puppies”- priceless! 🙂 The picture of you and your sister with Springy and her puppies is so wonderful- what a treasure. I love the old black and white photos! Oh, I love that picture. Is their anything better than roly poly puppies, well maybe chickies, and new grandbabies, maybe. You know, even after all those years if I close my eyes I can almost feel those little puppies. I love cats but puppies really are cuddlier than kittens! What a wonderful memory!! The picture is as precious as the story! I’m so glad you are posting these for Amara to enjoy – and that we get to have a glimpse of your life as well. Keep them coming! !